With an early April Pacific storm dumping 22+ inches of snow on our home range, the Bridgers, we figured that everywhere had been similarly blessed. 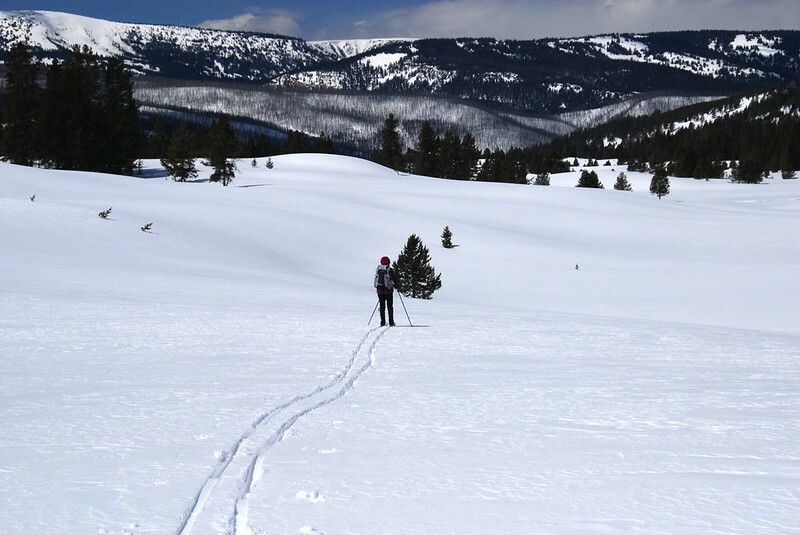 So, having done very little touring on the western side of the Park this winter, we headed for one of our favorite spots, Big Horn. 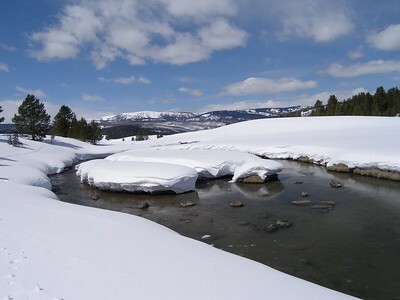 This area comprises the headwaters of the Gallatin River, in one of the primo snow belts in Western Yellowstone. 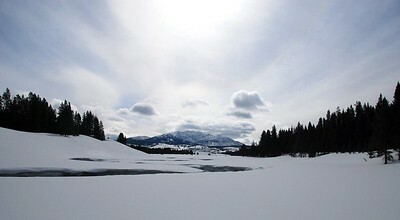 They say: Don't ski Big Horn in the wind, because it is so open. So we were pleased when we arrived at the trailhead, since there was virtually no breeze. That lasted at least 20 minutes. 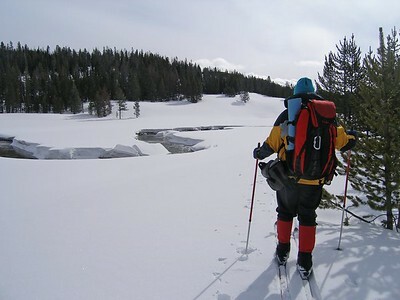 But the openess of the valley supports a DIY approach to ski touring. Go wherever looks interesting. And we did. Susie points out some of the great scenery. 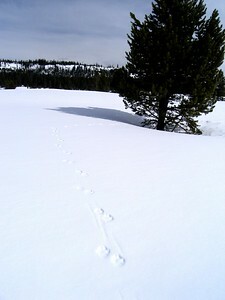 As we skied past the trailhead, it would have been easy to miss it. 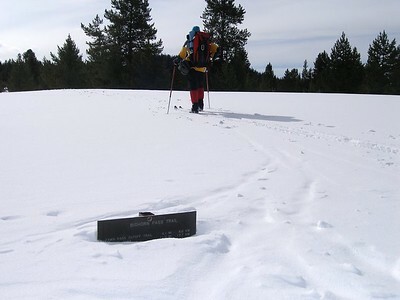 Even in this wind-exposed area, there was plenty of snow. A good look at the river. Right at this point, the wind started. GREAT!!! NOT!! We tried making our own route, as we attempted to tolerate the wind. 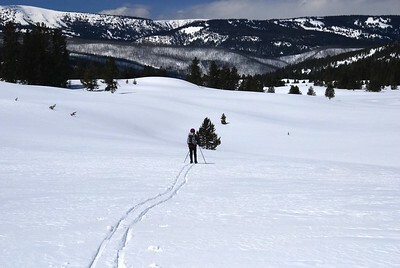 One of the challenges that skiing thru the woods to avoid the wind. 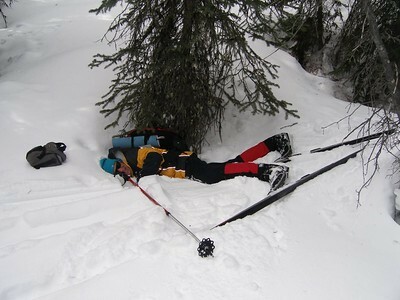 Roger was skiing downhill, and put is right pole into a tree well, and did a face plant. It took a while to dig out. OK, enough of the trees. We'll deal with the wind. Roger contemplates a higher route to avoid a tricky tight spot along the river. What a place. 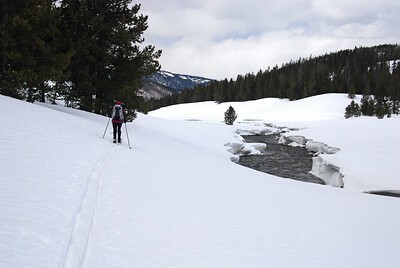 Susie is heading up too, to avoid the steep slope along the river. 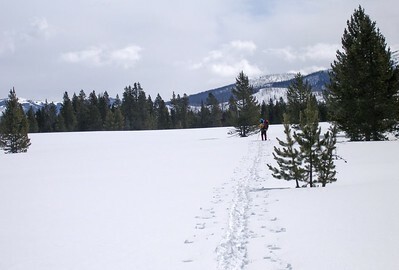 Breaking out in the open, we follow our own route, climbing to a high point for lunch. What a view for lunch! 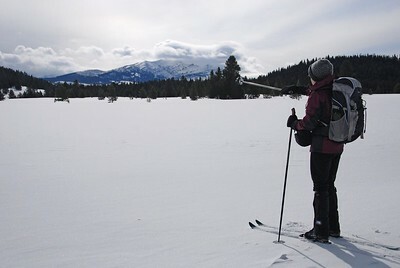 We had to work hard to try to find a spot with reduced wind. We were not real successful. Roger seems content to drink in the scenery. 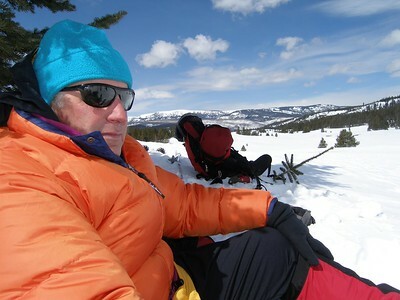 After lunch, the continuing wind helped us decide to turn around. But naturally, we did our own thing, descending on our own line. 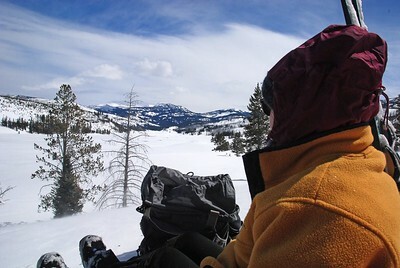 Taking a breather with the snow capped peaks to the west. 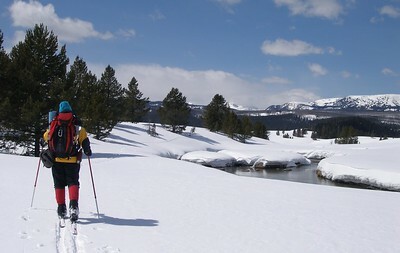 We picked up the usual ski route on the south side of the river. 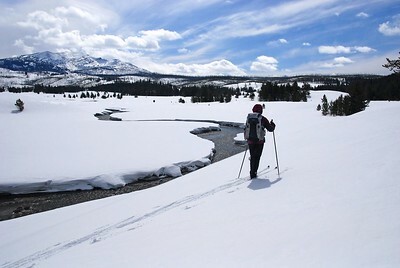 Lovely snow islands in the river. Another tight spot along the river. 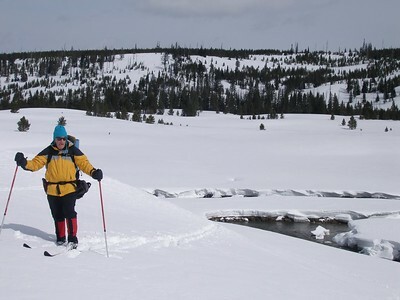 With wind blown hard pack in this area, it is another good example why we enjoy having metal edge skis. 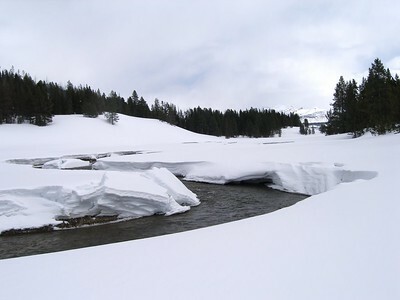 Collapsed snow along the river.